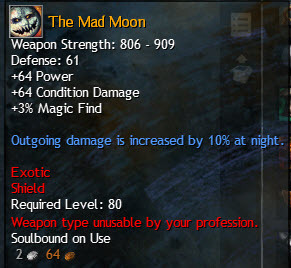 Here is a list of items that can be acquired during the GW2 Halloween event and will be gone once the Halloween event ends on Nov 1, noon PDT. Most of these items will still be available on the trading post but expect the prices to go up gradually. These raw materials are all needed for various recipes and only obtainable during Halloween. Trick of Treat bags are needed for the artificer tonics. Trick-or-Treat Bags link 25 copper. Merchants in Lion’s Arch (marked with Candy Corn icon in Trader’s forum) sell Artificer and Chef recipes for karma. 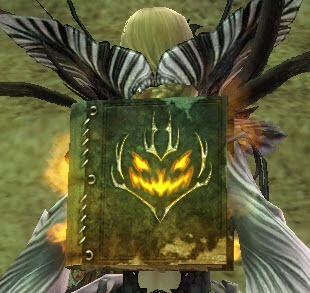 These recipes are account bound but you can also find tradeable chef recipes inside the trick-or-treat bags. 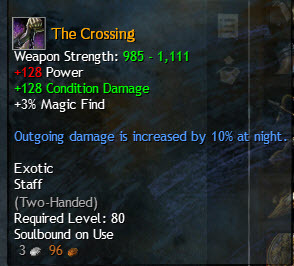 All of these weapons can be crafted (very pricy) or acquired from Ascent to Madness dungeon (ACT 3 exclusive). For pictures of these items, please consult this page. 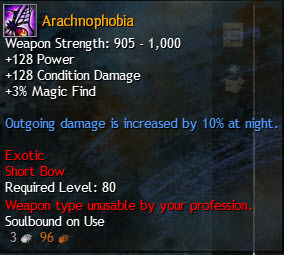 Crafting these weapons requires specific gifts whose recipes are discovered via Mystic Forge using a combination of Candy Corns and Halloween specific crafting materials. You can expect the price for these recipes to increase as well.Alternatively, these recipes can also be a very rare drop from Trick-or-treat bags or Personalized Trick-or-treat bags (higher chance). 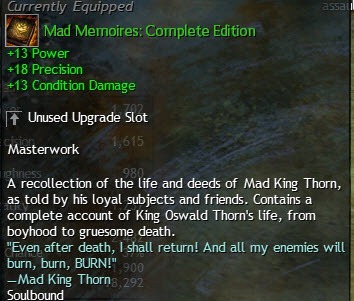 Weapon skins are rare drops from Black Lion Chests or Mad King Chests. For pictures of these skins, please consult this page. There are three versions of the recipes: Weaponsmith, Artificer, Huntsman for the sigils and Armorsmith, Leatherwork, Tailor for the runes. 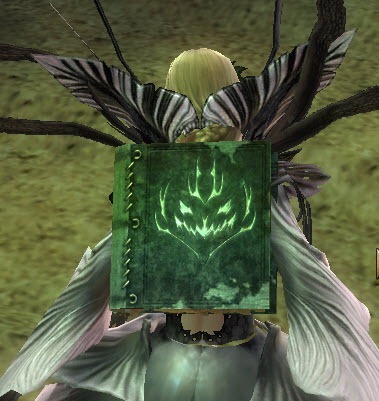 Recipes can be obtained via the mystic forge or obtained from opening Trick or Treat bags. There are also major version of these runes/sigils with inferior stats. 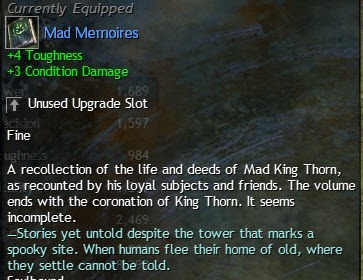 These Mad King armor pieces can be obtained from the Mad King Clock Tower (Slippers only), Mad King Labyrinth chests or chests at the end of Ascent to Madness dungeon. These armor does not have unique skin so the prices for quite low for them. For pictures of their appearance, please consult this page. The light and medium armor appearance are quite desirable so the prices are a bit high for them. 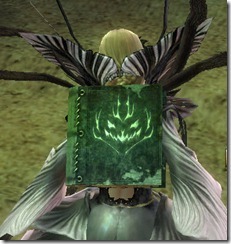 Medium chestpiece is especially desirable since it shows a lot of skin. 3 different shoulderpad skins are available. See their appearances here. These items in gem store are gone once the Halloween event ends. The first thing to grab off the gem store is the free Devil Horns. It is account bound. There is the Mad King’s Outfit and Witch’s Outfit. Both are 700 gems each (~$9). See images of them here. There is also the Phantom Hood for 200 gems. Four mini pets are avilable, it costs 1000 gems ($12.5) to get all 4.You can see images/videos of them on this page to decide if they are worth the purchase. Endless Halloween Tonic can be obtained from Trick-Or-Treat bags or the personalized version. It is a fairly rare drop and some people have opened over 5000 bags without seeing one. The tonic transform you into a random Halloween creature for 15 minutes. All of these items can still be obtained until the end of the Halloween event even if they are part of previous acts. 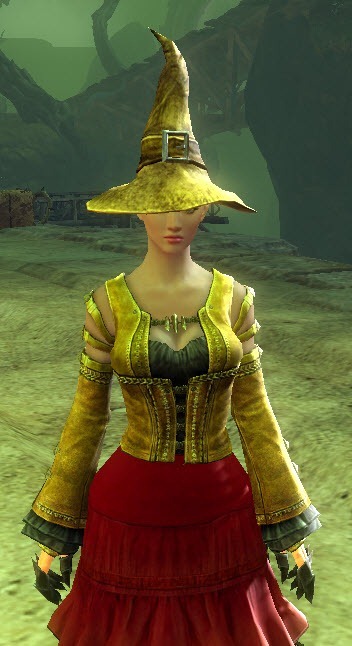 Witch’s Hat from Attend the Party one day event in Lion’s Arch. 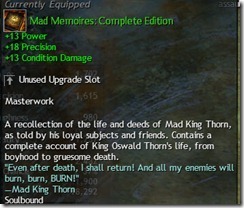 I obtained a Recipe: Gift of Souls from a Mad King’s Chest. There are also PvP Halloween finishers in cash shop, but they are one time only.. As well as tonics and ptots, but they can be obtained without using gems. It is also worth mentioning, that the soulbound on aquire version of slippers can be obtained 1/character from jumping puzzles.